Cast: Dwayne Johnson, Carla Gugino, Alexandra Daddario, Ioan Gruffudd, Paul Giamatti. Boasting of a strong star cast, San Andreas is a movie that keeps you hooked even if you know what’s going to happen next. And trust me, you do. Dwayne Johnson, needless to say, is the star of the movie and he proves it throughout the 2 hours of the movie. It follows the very used and done to death concept of showing a natural calamity which causes damage, lives are lost and how one family survives through it all. Rings any bell? It did to me. You can draw as many parallels as you want between San Andreas and 2012. The latter showed the destruction of the entire world and few people remaining to rebuild whereas San Andreas shows the same thing just on a small scale and concentrates only on the west coast of USA, primarily California coast. Direction of the movie is commendable with all the camera movements encompassing the scale of the destruction caused by the repetitive earthquakes. Brad Peyton has done a good job of directing the movie that carries the audience into the movie. Clearly, CGI and special effects has done most work of showing the destruction of California which is effective and impactful. 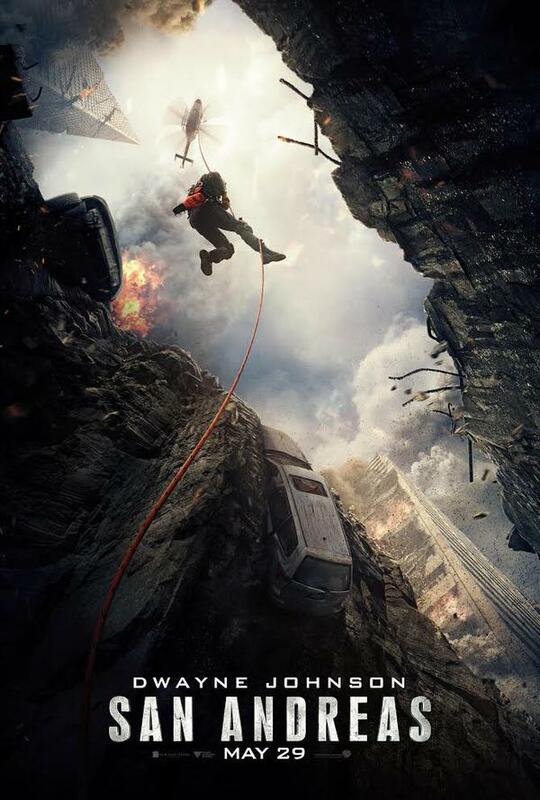 The movie follows the story of Ray (Dwayne Johnson), a helicopter rescue pilot, whose only focus in the movie is to save his 20-something daughter caught in the midst of the earthquake stricken San Francisco. He of course, had to save his ex-wife (Carla Gugino) first and the team of these two then proceeds to save their daughter. During this rescue operation they use all the possible mode of transportation! The Hoover Dam sequence will give you a quick glimpse of the iconic scene seen in Volcano where one saves the life of the other at the cost of their own. Both these sequences are equally dramatic. Like most movies, there’s also a backstory to our hero and it makes perfect sense to include it in the movie for the need of character development. Rest of the cast does their part effectively. Though I felt Ioan Gruffudd’s character Daniel Riddick was unnecessary in the movie and had been gotten rid of quickly enough. Of course everything is timed perfectly to create the tension and drama for the viewers. Spoiler alert! With a major natural calamity underway and the entire city being destroyed we have a happy ending. And yes, I’m a great fan of those! Even when you have left the theatre the movie leaves you with a thought which will linger and make you wonder if this is all fiction or there’s some future warning. It’s in a way teaching you to be prepared if nature does take that route, where you will have to fight for survival. To sum it up, go watch the movie. It definitely deserves to be seen on a big screen in all its 3D glory. Let me know your views on the movie in the comments below.